Rate this project GeckoLinux is a distribution based on openSUSE with a focus on providing a friendly, desktop platform with multimedia codecs out of the box. The project has published two new versions: Static 150 which is based on openSUSE's stable Leap edition, and GeckoLinux Rolling 999 which is based on openSUSE's rolling release Tumbleweed edition. "The GeckoLinux project is pleased to release updated spins of both Rolling and Static editions. GeckoLinux spins are based on the openSUSE distribution, with a focus on polish and out-of-the-box usability on the desktop. A large variety of customized desktop options are available in Static (based on openSUSE Leap) and Rolling (based on openSUSE Tumbleweed) editions. After installation to the hard disk, a GeckoLinux system will continue to receive updates from the openSUSE and Packman infrastructures. An installed system can even be upgraded smoothly to future openSUSE releases while at the same time retaining its unique GeckoLinux configuration." There are several desktop spins and a BareBones minimal spin of each edition. More information on both editions can be found in the release announcements (Static, Rolling). Download (Static, Rolling) (pkglist): GeckoLinux_STATIC_Cinnamon.x86_64-150.180607.0.iso (1,129MB), GeckoLinux_ROLLING_Cinnamon.x86_64-999.180607.0.iso (1,115MB). Also available from OSDisc. • 2016-11-04: Distribution Release: GeckoLinux 999.161031.0 "Rolling"
GeckoLinux is an openSUSE-based spin which features non-free packages not found in openSUSE's default repositories. The distribution's latest release, GeckoLinux 423, uses a new build system, called Kiwi: "Thanks to Kiwi, GeckoLinux now boasts the following improvements: Much smoother and more reliable startup. Splash screen during live system startup. Better hardware detection, especially X.Org startup with certain troublesome graphics cards. No more entering passwords for the live session user account. Live USB persistence - GeckoLinux can now be used as an excellent portable OS, not just as an installation medium. Cleaner ISO image build process and structure that is more in line with openSUSE." The new version also includes a repository containing NVIDIA drivers, enabled by default. Further information can be found in the project's release notes. Download (MD5, pkglist): GeckoLinux_STATIC_Cinnamon.x86_64-423.180107.0.iso (958MB), GeckoLinux_STATIC_Gnome.x86_64-423.180107.0.iso (951MB), GeckoLinux_STATIC_LXQt.x86_64-423.180107.0.iso (946MB), GeckoLinux_STATIC_Mate.x86_64-423.180107.0.iso (1,000MB), GeckoLinux_STATIC_Plasma.x86_64-423.180107.0.iso (1,001MB), GeckoLinux_STATIC_XFCE.x86_64-423.180107.0.iso (942MB). 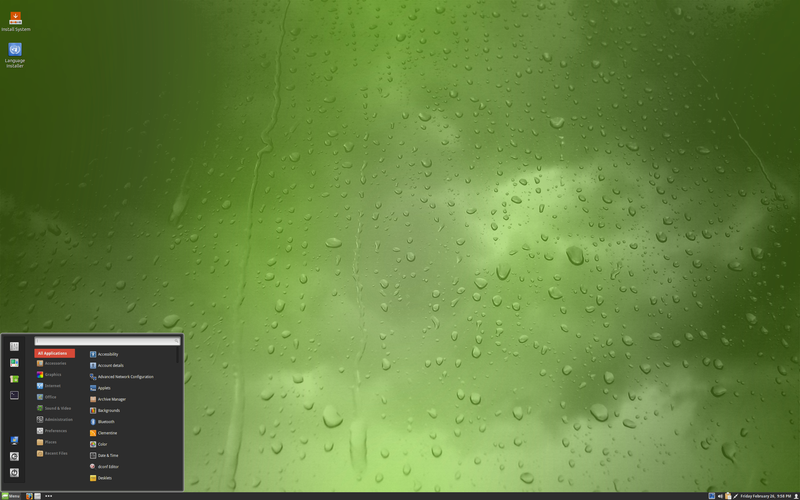 GeckoLinux is an openSUSE-based distribution designed to be easy to set up and use on desktop systems. The project has released a new development snapshot, GeckoLinux 423.171028.16 Beta, which introduces several new improvements and features the Cinnamon desktop environment. "Thanks to Kiwi, GeckoLinux will now boast the following improvements: Much smoother and more reliable startup. Splash screen during live system startup. Better hardware detection, especially X.Org startup with certain troublesome graphics cards. No more entering passwords for the live session user account. Live USB persistence - GeckoLinux can now be used as an excellent portable OS, not just as an installation medium. Cleaner ISO generation process that is more in line with openSUSE. GeckoLinux is a live installable system, with two installer options: The default recommended installer is Calamares, now at the latest version 3.1.7. This version in conjunction with an updated set of underlying tools offers a huge number of improvements and bug fixes that should lead to smooth and successful installations for almost everyone." More information can be found in the project's release announcement. Download (MD5): GeckoLinux_Static_beta.x86_64-423.171028.16.iso (957MB, pkglist). The GeckoLinux project is an openSUSE-based, desktop oriented distribution. The project provides eight different editions with live discs for testing purposes. The latest version of the distribution, GeckoLinux 422.161213.0, is based on openSUSE 42.2 Leap and includes many package updates. "Changes to all GeckoLinux Static editions: The base system has been updated to openSUSE Leap 42.2, with updated versions of the Linux kernel (4.4.36), systemd (228), GTK+ (3.20), Qt (5.6.1) and glibc (2.22). Also the GeckoLinux language-installer.sh script for non-English language packs has been updated to be more reliable and easy to use. Also the script created by Mindaugas Baranauskas to ensure that X.Org correctly starts has been significantly improved, and SiS graphics support has also been included. Perhaps the most important change is that the old yast2-live-installer that served us well for past releases is no longer supported by openSUSE and no longer works. Therefore, it has been replaced by the Calamares universal installer framework." Further information can be found in the project's release announcement. Download (MD5, pkglist): GeckoLinux_Cinnamon.x86_64-422.161213.0.iso (970MB), GeckoLinux_Mate.x86_64-422.161213.0.iso (1,013MB), GeckoLinux_Gnome.x86_64-422.161213.0.iso (981MB), GeckoLinux_Plasma_Stable.x86_64-422.161213.0.iso (1,042MB). 2016-11-04 Distribution Release: GeckoLinux 999.161031.0 "Rolling"
The GeckoLinux project has announced the release of new snapshots of the distribution's rolling release branch. The GeckoLinux distribution is based on openSUSE and is available in eight editions. "Hi everyone, I'm pleased to announce updated releases of all eight (8) spins of the GeckoLinux Rolling editions. The GeckoLinux Rolling editions are live installable images based on openSUSE Tumbleweed with its frequent and extremely well tested stable rolling releases, combined with Packman driver and multimedia support. After installation, GeckoLinux Rolling systems can be easily updated in sync with the current release of openSUSE Tumbleweed. These GeckoLinux Rolling 999.161031 spins have been a long time in coming, as a huge number of Tumbleweed changes have occurred in the interim." Further information can be found in the project's release announcement. Download (MD5) (pkglist): GeckoLinux_ROLLING_Cinnamon.x86_64-999.161031.0.iso (1,034MB), GeckoLinux_ROLLING_XFCE.x86_64-999.161031.0.iso (1,029MB), GeckoLinux_ROLLING_Gnome.x86_64-999.161031.0.iso (1,037MB), GeckoLinux_ROLLING_Plasma.x86_64-999.161031.0.iso (1,115MB).